Sepp Blatter has been re-elected president of Fifa, football's world governing body, in a vote overshadowed by arrests and corruption allegations. 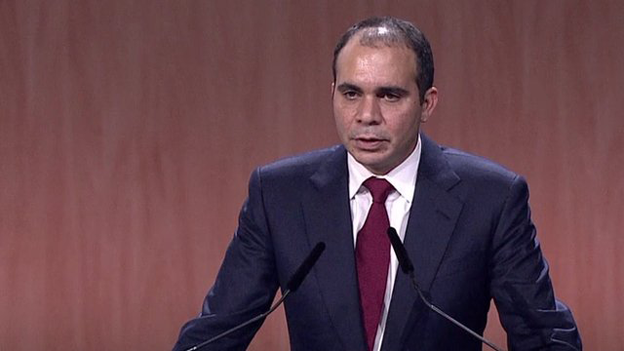 Mr Blatter's rival, Prince Ali bin al-Hussein of Jordan, had forced a second round of voting but withdrew. In his victory speech, Mr Blatter said: "I'm not perfect. Nobody is perfect. But we will do a good job together." Seven top officials were arrested in Switzerland on Wednesday as part of a US prosecution that indicted 14 people. Mr Blatter, 79, has faced calls to resign, including from UK Prime Minister David Cameron, who said in Berlin on Thursday that the Fifa president should quit "the sooner the better". But Mr Blatter hailed his victory, thanking all those who voted from him and praising the bravery of his rival, Prince Ali, for withdrawing. 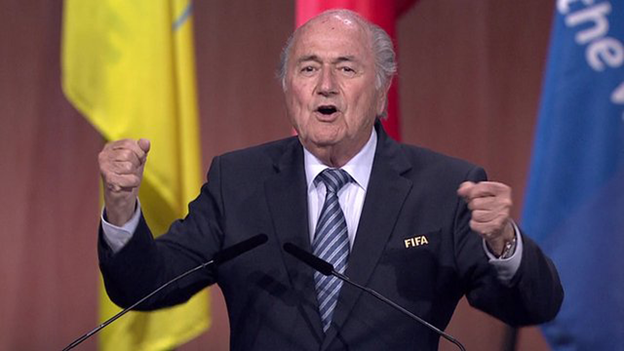 In a rambling victory speech, he said: "I take the responsibility to bring back Fifa where it should be." He also hinted that this term in office, his fifth, could be his last, saying: "At the end of my term I will give up Fifa in a strong position." In conceding, Prince Ali said: "It's been a wonderful journey... And I want to thank in particular those of you who were brave enough to support me." Michel Platini, the president of the European football body, Uefa, which had backed Prince Ali, said: "I am proud that Uefa has defended and supported a movement for change at Fifa, change which in my opinion is crucial if this organisation is to regain its credibility." Global citizens' movement Avaaz, which started the #BlatterOut campaign, quickly condemned the re-election. If you read most of the world's media, Sepp Blatter's ability to hang on to power at Fifa is nothing short of miraculous. After years of negative headlines, the frenzy has reached fever pitch in the wake of the US allegations of corruption - even though Mr Blatter himself has not been implicated. And running through all this is a theme - bemusement that much of the football world keeps voting for him. Nowhere is Sepp Blatter's support stronger than across Asia and Africa. So why do most of the representatives from those two continents appear to be voting for him again? Here's about as succinct an answer as you're going to get - from the president of the Nigerian Football Federation: "Blatter feels Africa. What Blatter pushes is equity, fairness and equality among the nations." We're talking about two things - the first is concrete investment, often literally so. The second is respect. Campaign director Alex Wilks said: "More dirty dealings in Fifa's halls have crushed the hopes of billions of football fans." But there were congratulations from Russia. The head of the Russian Football Union, Nikolay Tolstykh told the R-Sport channel Mr Blatter was an "experienced leader" who "understands well the organisation's current problems and sees ways to resolve them". The vote took place at Fifa's congress in Zurich. In the first round Mr Blatter won 133 to Prince Ali's 73, just short of the 140 votes needed for an outright win. Those indicted in the US inquiry are accused of bribery, racketeering and money-laundering involving tens of millions of dollars since 1991. The aim of the bribes was to influence the outcome of bids to stage football tournaments such as the 2010 World Cup in South Africa and the 2016 Copa America in the US, prosecutors say. 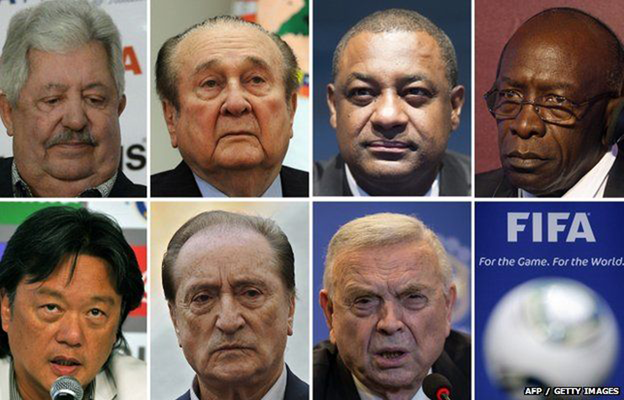 The seven arrested in Zurich - Jeffrey Webb, Eugenio Figueredo (both Fifa vice-presidents), Eduardo Li, Rafael Esquivel, Jose Maria Marin, Costas Takkas and Julio Rocha - remain in Swiss detention pending US extradition proceedings. They can appeal against their detention by 8 June, but Swiss justice officials told the Associated Press bail was unlikely. The first of the 14 to be arraigned in a US court, sports executive Aaron Davidson, pleaded not guilty through his lawyer on Friday. Swiss prosecutors have launched a separate investigation into the bidding process for the World Cup tournaments in 2018 in Russia and 2022 in Qatar. Many of Fifa's major sponsors, including Coca-Cola, Visa, Adidas, McDonald's, Hyundai Motor and Budweiser, have expressed concern over the investigations. After Mr Blatter was re-elected, Coca-Cola said in a statement that Fifa "must now seize the opportunity to begin winning back the trust it has lost". Greg Dyke, the chairman of the English Football Association, told the BBC: "Sepp Blatter has run this organisation for 16 years, and for all of those 16 years, there have been levels of corruption. Sepp Blatter is not the man who is going to be able to change that."